Depending on which scholar you ask, science fiction begins at so many different stages in human history that it is hard to find a common ground for discussion of the pre-20th century sf. Almost all scholars can agree on the fact that the term itself is an invention of the 20th century and that pulp magazines developed the genre into what we commonly understand as classical sf. But that is about all the consensus you will get. James Gunn, editor of one of the largest and best sf-anthologies on the market, starts his Road to Science Fiction with the Summerian epic of Gilgamesh (2000 BC) and in the first volume includes “examples and works that preceded and led up to the contemporary expression of science fiction in magazines and books” (xi). In its pages Gunn includes not only mythology dating back to ancient Greece and Rome, but also many examples from other genres. Similarly, Mark Bould and Sherryl Vint discuss literary predecessors of science fiction in their Routledge Concise History of Science Fiction (20-39): they name examples of Utopian literature, adventure stories, apocalyptic fiction and tales of science and invention, all of which have had influence on the development of sf and intersect with it. Most famously though, critic Brian Aldiss argued in his seminal work Billion Year Spree from 1973 that sf “was born in the heart and crucible of the English Romantic movement in exile in Switzerland, when the wife of the poet Percy Bysshe Shelley wrote Frankenstein: or, The Modern Prometheus” (3). Gothic fiction, rationalized by modern science, thus becomes an important influence to sf which editor Hugo Gernsback picked up on, when he defines what he calls “scientifiction as ‘the Jules Verne, H.G. Wells, and Edgar Allan Poe type of story – a charming romance intermingled with scientific fact and prophetic vision'” (Gernsback quoted in Bould and Vint 6). The following lecture examines traditions of literary expression that have come before this statement and the earliest definition of science fiction as a genre. Bellamy, Edward. Excerpt from Looking Backward (1888) – pages 279-303. The famous and most influential utopian socialist novel in US literary history. It has spawned many literary copies and rebuttals, none of which could even come close to Bellamy’s vision of a future Boston. Hawthorne, Nathaniel. “Rappaccini’s Daughter” (1844) – pages 162-185. Hawthorne’s mad scientist experiments not in mechanics but in early genetics, creating the most deadly plants in his backyard and keeping his daughter among them – until she falls in love with a young student. Shelley, Mary. Excerpt from Frankenstein (1818) – pages 149-158. Mary Shelley’s novel is, according to Brian Aldiss, the first real science fiction novel, in which superstition gave way to rational and scientific explanation. Aside from this excerpt, the complete novel is worth a extended look in regards to its sf origin. Swift, Jonathan. Excerpt of the chapter “A Voyage to Laputa” from Gulliver’s Travels (1726) – pages 90-118. 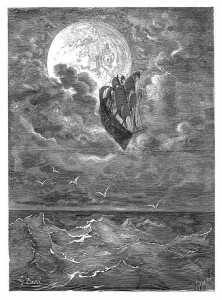 In this excerpt, Swift’s protagonist Lemuel Gulliver visits the floating island of Laputa and is introduced to their achievements in mathematics and the sciences. This biting satire is aimed at the Royal Academy, its experiments and what Swift perceived as a lack of practical use of science. Verne, Jules. Excerpt from Twenty-Thousand Leagues Under the Sea (1870) – pages 227-244. As one of the forefathers of Gernsbackian ‘scientifiction’, Verne provided scientifically sound extrapolations of existing technology in connection with adventure stories. This is his most famous book and well worth while in more than just an excerpt. Wells, H.G. “The Star” (1897) – pages 339-348. A short story by another forefather of science fiction, dealing with a comet aimed directly at Earth and the consequences of its imminent destruction. Its commentary is rather social in scope, less scientific, but it shows the interest, scope and reach of one of sf’s most important writers. Hawthorne, Nathaniel. “Rappaccini’s Daughter” (1844) – pages 1-25. / Wells, H.G. “The Star” (1897) – pages 39-49. Verne, Jules. Excerpt from Journey to the Centre of the Earth (1864) – pages 26-38. Similar to the excerpt from Twenty-Thousand Leagues, these few pages give an introduction to Verne’s expertise at extrapolation, his romance writing and the origin of science fiction in French ‘voyages fantastique’. Hoffmann’s story is one of best examples (written during the Romantic movement) of proto-sf and makes use not only of optics and mechanics but also showcases the rational, mechanist worldview and its problems at grasping the world – as such it balances between Gothic and sf. Poe’s short story deals with the scientific invention of an aeronautical device that allows for a journey to the moon. It was probably the origin of the “Ballon Hoax” in New York and for Jules Verne’s novel From Earth to Moon. Wells, H.G. “The Time Machine” (1895) – free internet version at the University of Virginia Library. Wells’ novel is an excellent example of early (proto-)sf and showcases all of Wells later trademarks, his scientific exploration of possible technologies, his social concerns and extravagant scope of vision. Compare the images of the scientists in selected texts from Hoffmann, Shelley, Hawthorne and Verne. Discuss the changes to earlier examples such as Goethe’s or Marlowe’s Faust characters. Compare the narrative methods employed in selected texts from Swift, Poe, Bellamy and Wells. Notice literary traditions such as the satire or utopian literature. Compare the social role of technology that texts like Swift, Bellamy or Wells discuss with their respective realities and today. Aldiss, Brian W. Billion Year Spree – the True History of Science Fiction. Garden City: Doubleday, 1973. Print. Bould, Mark and Sherryl Vint. The Routledge Concise History of Science Fiction. Milton Park: Routledge, 2011. Print. Gunn, James, ed. The Road to Science Fiction. Vol. 1: From Gilgamesh to Wells. Lanham: Scarecrow, 2002. Print. Stableford, Brian. 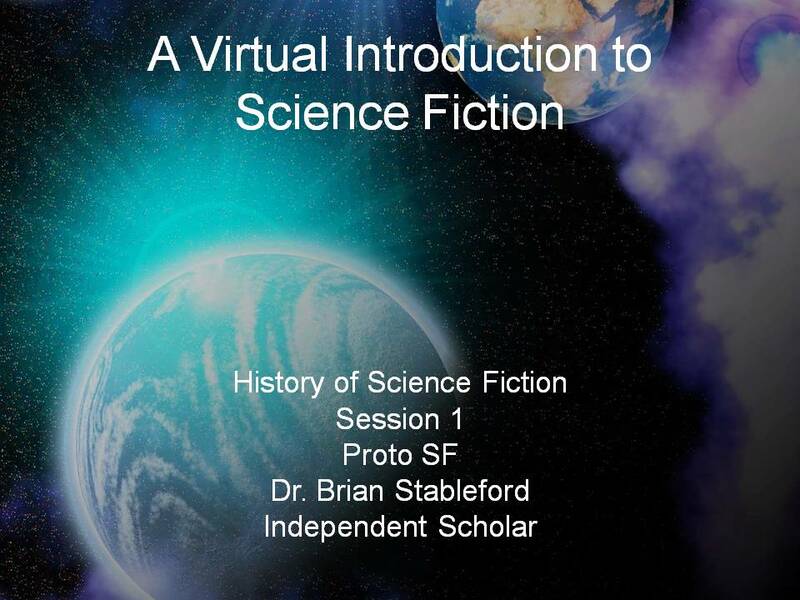 “Proto-SF (History of SF up to 1900s)”. Video Lecture. A Virtual Introduction to Science Fiction. Ed. Lars Schmeink. Stableford, Brian. “Science Fiction Before 1900”. A Virtual Introduction to Science Fiction. Ed. Lars Schmeink. Web. 2012. Schmeink, Lars. “Proto-SF”. Web Page. A Virtual Introduction to Science Fiction. Ed. Lars Schmeink. Web. 2012.